Thousands of galaxies crowd into this Herschel image of the distant universe. 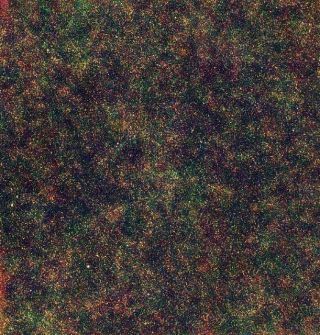 Each dot is an entire galaxy containing billions of stars. This image image was taken in a region of space called the Lockman hole, which allows a clear line of sight out into the distant Universe. This "hole" is located in the familiar northern constellation of Ursa Major, The Great Bear. Full story. A mind-boggling new image of space packed with thousands oftiny dots of color, each one a distant galaxy, is showing astronomers that thebrightest galaxies tend to be in busiest parts of the universe. For over a decade, astronomers have been puzzled by somestrange, bright galaxies in the distant universe which appear to be formingstars at phenomenal rates, making them very hard to explain with conventionaltheories of galaxy formation. The crucial new image from the EuropeanSpace Agency's HerschelSpace Observatory can help astronomers firm up their theories of galaxyformation. Among the important questions: What fueled the formation ofthese bizarre galaxies, and what kind of environment they are located in? Theanswer to part of that question hinges on how close the galaxies are to eachother. That's where Herschel came in. With its ability for very sensitivemapping over wide areas, the orbiting telescope managed to see thousands ofthese galaxies and identify their location, showing for the first time thatthey are packed closely together in the center of large galaxy clusters. Herschel sees material that cannot be seen at visiblewavelengths, namely cold gas and dust between the stars that shine in infraredlight. The SPIRE instrument on Herschel has been surveying largeareas of the sky, currently totaling 15 square degrees ? around 60 times theapparent size of the full moon. The two regions mapped so far are in theconstellations of Ursa Major and Draco. Galaxies which appear brightest in the far-infraredwavelengths that Herschel sees are typically observed as they were around 10billion years ago ? the length of time it took their light to reach Earth. In Herschel's new image of one of these regions ? afalse-color view of a small portion of the sky ? the telescope found thousandsof tiny colored points of light, each of which is an entire galaxy that in turncontains billions of stars. The colors represent the far-infrared wavelengths measuredby Herschel, with redder galaxies either being further away or containingcolder dust, while brighter galaxies are forming stars more vigorously. The image shows that the galaxies are not scattered randomly? there are regions which have more galaxies, and regions that have fewer. Thisclustering of galaxies through space provides information about the way theyhave interacted over the history of the universe. These esults show that the bright galaxies detected with theSPIRE instrument preferentially occupy regions of the universe that containmore dark matter, the invisible, mysterious stuff that makes up three quartersof the matter in the universe. This preference seems to be especially trueabout 10 billion years ago, when these galaxies were forming stars at a muchhigher rate than most galaxies are today. The closeness of galaxies in the early universe means theywere more likely to collide with one another. It is these collisions that stirup the gas and dust in the galaxies and cause the rapid bouts of star formation. "All indications are that these galaxies are busy. Theyare crashing, merging, and possibly settling down at centers of large darkmatter halos," said Asantha Cooray, of the University of California andone of the members of the team that made the new observations. The work, which was presented last week at the HerschelFirst Results Symposium in the Netherlands, will also be detailed in anupcoming special issue of journal Astronomy & Astrophysics dedicated to thefirstscience results from Herschel.